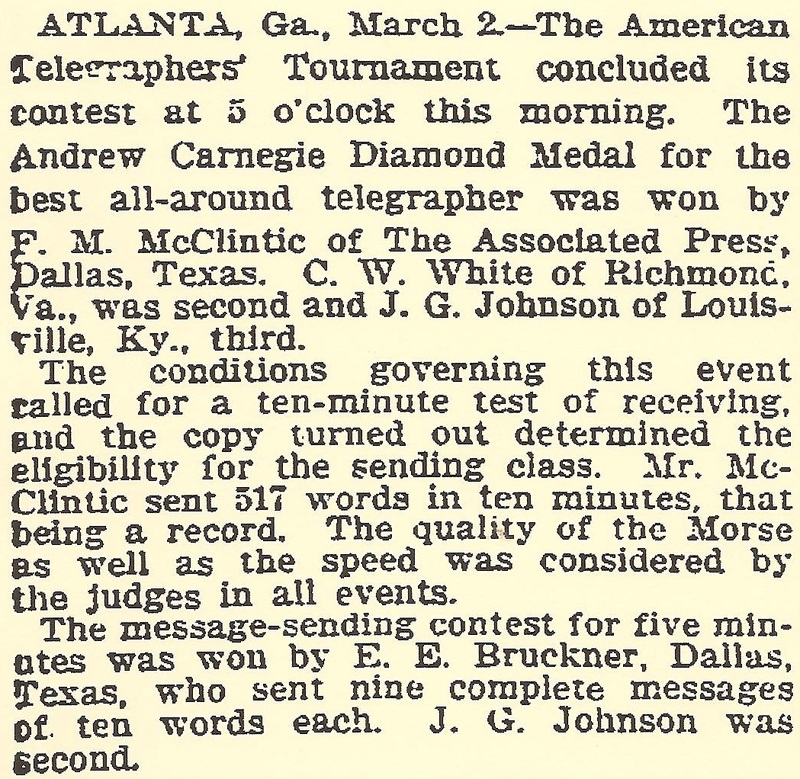 That's, from left, Harry V.Emanuel, of Western Union, Philadelphia, the "Telegraph Message Receiving Champion of America"; Charles H.McGurrin, of Kalamazoo, Michigan, "Reporter and United States Commissioner Typewriter, Speed Champion of the World"; and F.M.McClintic, of Associated Press, Dallas, Texas, "All Around Telegraph Champion of America". 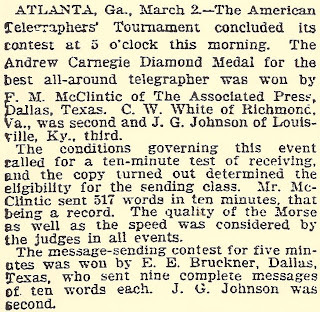 According to The Story of Telecommunications (1992), written by George P. Oslin, a reporter and executive at Western Union, McClintic set the fastest ever Phillips code speed with 326 words in five minutes at a tournament in Atlanta in 1902. Next Mr McGurrin. I'm assuming he's a younger brother of the great Frank Edward McGurrin - he was certainly mentioned in F.E.McGurrin dispatches. 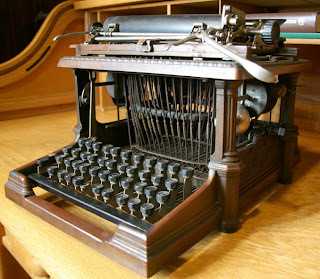 Not a lot is known about Charles H.McGurrin, but Wikipedia tells us that Frank Edward McGurrin "invented Touch Typing in 1878. He was a court stenographer at Salt Lake City who taught typing classes. 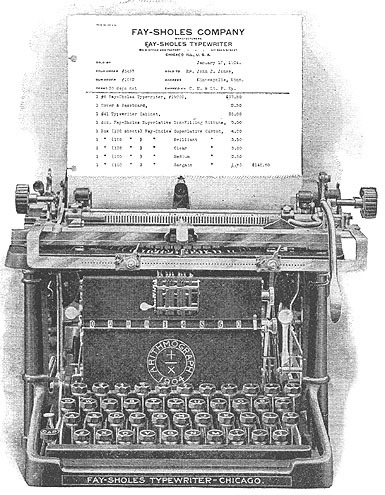 He taught himself to touch type without looking at the keys ... On July 25, 1888, McGurrin, who was purportedly the only person using touch typing at the time, won a decisive victory over Louis Traub [operating a Caligraph with eight-finger method] in a typing contest held in Cincinnati. The results were displayed on the front pages of many newspapers. 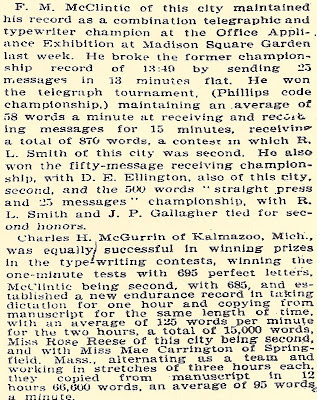 McGurrin won $500 and popularised the new typing method. 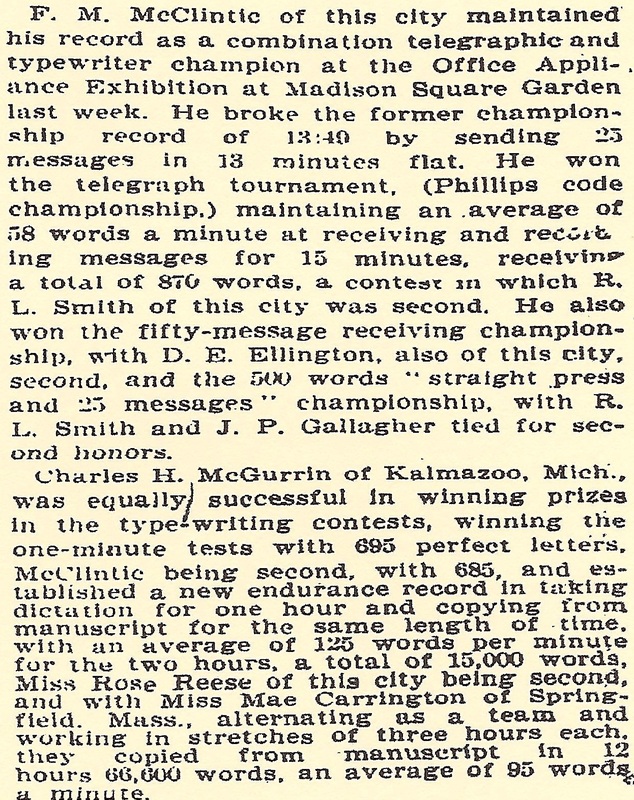 Whether McGurrin was actually the first person to touch type, or simply the first to be popularly noticed, is disputed. 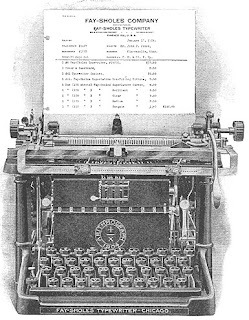 Speeds attained by other typists in other typing competitions at the time suggest that they must have been using similar systems." Finally, the sad tale of what befall Harry Victor Emanuel after his glory days behind a Fay-Sholes. The Pennsburg Town and Country of Saturday, November 19, 1904, reported: "FREES MAN FROM JAIL. Harry Victor EMANUEL, the expert telegrapher, was released from jail, at Norristown, shortly after 4 o'clock Saturday afternoon. He was sentenced on October 10 to 30 days and $500 fine for his connection with the West Manayunk pool room. His sentence expired on Thursday, but as the fine was not paid he was not released. Saturday afternoon a woman dressed in black appeared and produced the necessary amount to secure EMANUEL's release. 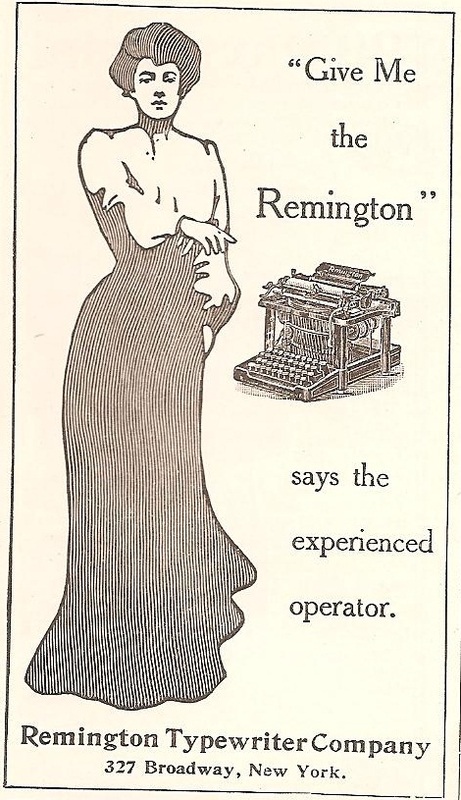 The attorneys for the telegraph operator refused to divulge her name, but intimated that she was a close friend and had saved the money herself to secure his release. EMANUEL and his friend left for Philadelphia at 5 o'clock that same afternoon." Well, at least he had one good friend left in the world ... but it makes one wonder what happened in that pool room! 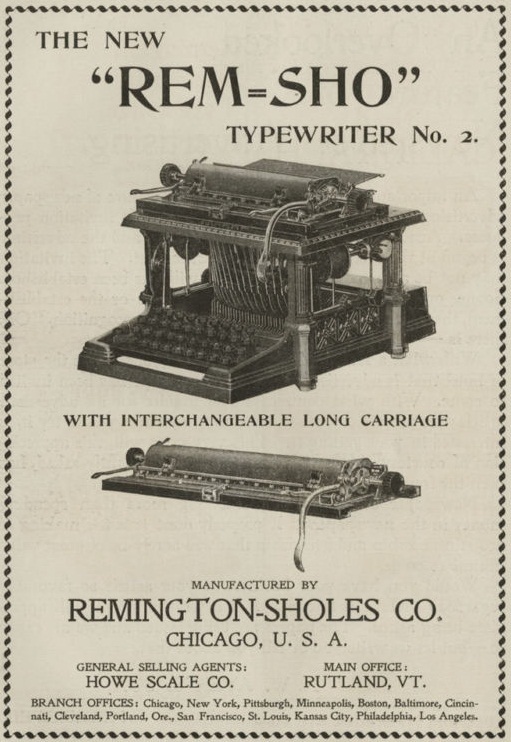 PS: I have just now come across this reference to the McGurrins as brothers in a 1921 paper called “Making Shorthand Teaching Effective” by John Robert Gregg. had acquired by extraordinary concentration the ability to do the unusual — just like the armless freaks in the sideshow who write with a pen between their toes. Great entry! 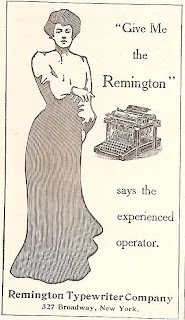 I wonder who subscribed Collier's Magazine on your behalf 104 years ago? Interesting things revealed in these adds, esp. the reference to the court case imposing the name change for ***-SHO. And I would rather obey the Lady in the last picture - she seems to have the first and the last say. Coincidentally, there is a Fay-Sho for sale on German ebay right now.